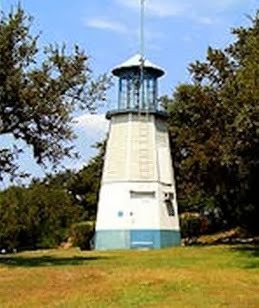 I tried putting all of my sailing-in-the-middle-of-the-fleet tips into an actual event at the final Texas circuit event of the year, which was the Wurstfest Regatta at Lake Canyon Yacht Club. It was a good turnout with 23 boats that included Olympic Coach Luther Carpenter, who I had not had the pleasure of sailing with before, and Hank Saurage, former runner-up at the Sunfish Worlds. It was a good fleet with lots of speed. Do your circles. I checked the wind direction several times before the start of each race and had good compass readings. Surprisingly, I was the only person in the top five sailing with a compass. Using the unfavored end. The line was short so the bias didn't really matter. I started at the committee boat end most of the time to be able to tack away to stay in clean air if needed. Clean air right after the start. Starting beside the committee boat worked except for race 6 where a junior got in the way (I refuse to yell at kids). I ended up in the third row, tacked away, and missed the first shift. Being out of phase, my position at the first mark was about 15 ... such is the luck in sailing. It was by far my worst race. When is someone ahead or behind? This was really important in the last few races because Luther was within a few points and there were lots of shifts. Knowing when to tack was important because it was a balance between staying in the pressure and keeping track of where Luther was. Several times he got away and had the speed to stay in front. What to do with clean air. You could see the wind velocity on the water and the fleet that started ahead gave us good clues about the direction, so sailing with your head out of the boat was really important. Staying in clean air. The fleet tended to stay together so it was really important making sure to stay in a lane with good pressure. With so many good sailors in this fleet, lack of pressure could cost you many places very quickly. Windward mark strategies. The courses were windward-leeward and some of the mark roundings were crowded. The trick was not getting to the starboard tack layline too early and then getting away from the crowd ASAP after the rounding. Finding clean air downwind. This was really important. It was balancing the need to stay in the pressure while staying out of others' wind shadows. At one point I thought I was OK until I looked at a flag at the top of the boat behind me and realized that what I felt and what I saw were different. I often changed sides to stay in the pressure and this worked well. These factors worked and the results can be seen here. OK, I admit that my boatspeed was better than your average middle-of-the-fleet-sailor because of my training for the Oman Worlds that start later this month. But without these sailing-in-the-middle-of-the-fleet tips there would have been no way to stay with Luther, Hank, and several of the other great sailors in these tricky lake conditions. From Pam: Oh now he's just screwing with us. Yeah, right! Just get a good start, stay in clean air, go the right way and avoid the crowds and you too can win the regatta. Sure you might have one bad race but you can always throw that out. Not real helpful for those of us whose best laid plans just don't work out quite like we expect them to. 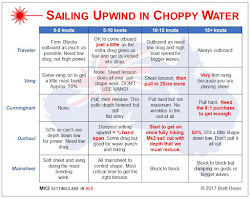 So, what I'm hearing is that even the top sailors are following some of the same basic rules of thumb as the rest of us but they are just doing it better. I get the opportunity to debrief Doug after racing. He loves the close racing and loves it when he's able to do something that others can see happening but can't quite figure out how to copy. 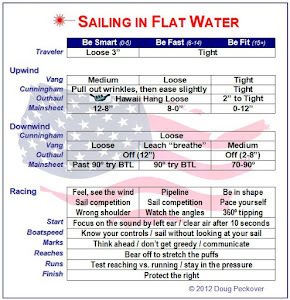 So, here's a shift, while Doug writes about how easy it is for middle of the fleet sailors to do well. I'll write about how easy it is for top of the fleet sailors to do better. This past weekend was light and gusty. Doug is surprisingly consistent in that stuff and I've figured out one of his secrets. He doesn't rely on tell-tales and feels the wind and anticipates better than most. That makes his gear shifting super smooth and he doesn't lose momentum which pays bigger dividends in the light stuff. Middle of the fleet sailors aren't good at shifting gears period. Top of the fleet sailors have an easier time shifting gears when the wind picks up than when the wind lightens up. When Doug see a puff coming, he hikes out and heels the boat to windward and traps the puff so that when it hits, it brings him vertical instead of knocks him down and spills the puff. He gains. When Doug feels the puff lighten up (the boat begins to go slow), he eases everything and powers up so that he keeps moving. He can gain two boat lengths this way. Yeah, I mean that's so simple, don't know why all the top guys can't do that. Well done. You make it sound so easy. 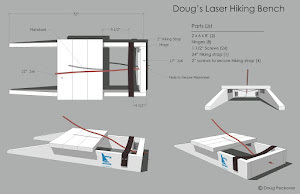 Good to see Hank Saurage and Ash Beatty sailing Lasers. I know they have both been among the best Sunfish sailors in the US for many years. Have they moved over to the "dark side" permanently or was it a one time thing for this regatta? I'm seeing them more and more, so they might well have moved over. It's great to have sailors of this caliber racing with us. I hope you are going to post some more details about how you train for the Worlds. What kind of on-the-water training do you do? And what kind of physical fitness training do you do? What do you work on in the last 6 months, 3 months, 1 month, say? Do you do any specific mental training? I'd be happy to write this up in another post.